Uniquely designed for commercial storage needs, the Anchor Hocking Montana jar is an indispensable addition to any kitchen or other place of business. 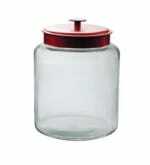 This jar comes with a red metallic cover to ensure that the contents that are placed within stay there until needed. And with a 2 gallon capacity, you are sure to find ample room for whatever you need to store!